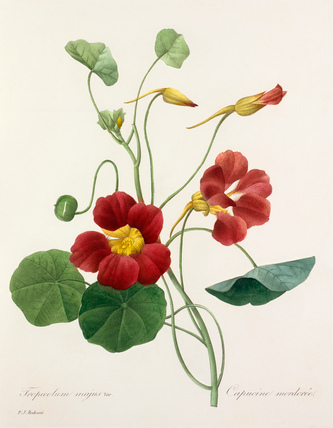 Colour engraving of 'Tropaeolum majus var' (nasturtium) by P.J. Redouté from 'Choix des plus belle fleurs' published in 1827. The publication contains 144 colour plates of flowers, some including insects, and is dedicated to the princesses Louise and Marie d'Orléans.